5 Best Airbrush Gun on Market: Know Better to Buy an Airbrush Gun! What Airbrush make up is now on the trend because it promises a flawless makeup look. Airbrush makeup gives a sheer or more dramatic makeup look depending on the application, the products used and the skills of the person applying the makeup. The flawless promise of airbrush makeup depends greatly on the quality of the applicator. 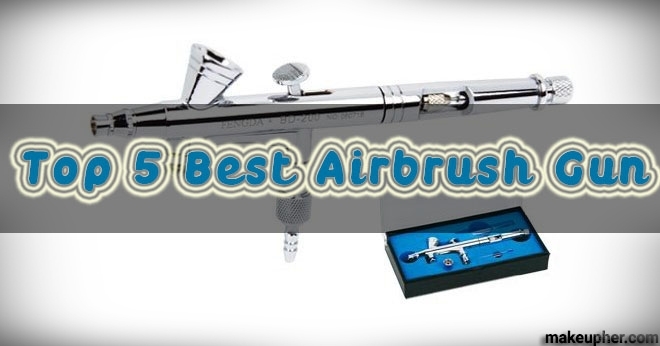 In this article, we are reviewing some products that all claim to be the best airbrush gun. But first, we need to know what an airbrush gun really is. The first airbrush gun was invented in the 1800s. It was first used to paint plates by means of a compressor. An airbrush gun passes a stream of compressed air through a venture which creates a reduction in air pressure. The reduction allows the paint to be pulled out from a reservoir. Because of the speed of the air stream, the paint is then ejected in the form of very tiny droplets. It is important to keep your airbrush gun clean by washing it after application. What are the best airbrush gun? There are two types of airbrush guns available. Singe action airbrush makeup guns are pretty much like sprays. You just press a nozzle, and the makeup is released. The amount of the pigmentation can be adjusted by changing the depth of the needle inside the nozzle. With the dual action airbrush makeup guns, you should press down for air and pull back for pigment. This means that the amount of applied makeup can be changed as you go, with no need to stop or adjust anything. Generally speaking, makeup professionals use dual action airbrush guns more than single action ones. This is because they provide more control over the amount of makeup applied. They can also be easily manoeuvred to apply contour and fine lines. They are ideal for achieving a truly even, and flawless makeup look. This explains how the paint or makeup moves through the airbrush gun. The gravity feed pulls the paint down till it reaches the tip of the nozzle. It requires less pressure than other types of feed, and this enables the makeup artist to have more control on the gun. It is perfect for achieving fine details and flawless application. The siphon feed is a little bit less common. It has a bottle where the pigmentation is fed and then pressed. The makeup is pulled towards the nozzle with more pressure required. They allow for more application since they can accommodate more pigmentation. There are also hybrid applicators that allow you to switch between the different types of feed depending on the area you are applying the makeup to. The action of a top quality airbrush gun will depend greatly on the performance of the compressor. The gun should be checked to know the pressure in terms of pounds per square inch or PSI. The lower the PSI the more detailed and finer the application will be. Higher PSI is suitable for applying body makeup. It is not true that all types of makeup can be used with airbrush guns. You should be careful about choosing the makeup you are feeding into your airbrush gun. Experiment with different types and brands and stick to the recommendations provided by the manufacturer. You can check some of the airbrush gun hobby lobby recommendations for best makeup brands that are suitable for this application technique. The brand name: Don’t buy an airbrush makeup gun that doesn’t have a brand name or any information about the manufacturing process. These applicators get in contact with makeup which is mainly made from chemicals. You don’t want a makeup applicator that would react with your makeup. The best airbrush gun should be easy to hold and control. The ability to move the applicator easily will greatly affect the quality of the makeup look. 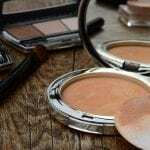 Heavy applicators will strand the hand of the makeup artist who is using them, which means that they could accidentally touch the area or face where the makeup is applied to. It features dual action application for extreme control. This airbrush makeup gun can be successfully used to apply makeup in precise details. It is made from lightweight materials that won’t react with your makeup. The trigger control will enable you to control the amount of pigmentation used with just a simple click. You will not have to stop mid application to adjust anything. The gravity feed allows for adequate pressure to apply all kinds of makeup to the face and body with a 7cc feed, enough to apply makeup to the entire face and neck. This is a multi-performance high quality airbrush makeup kit that won’t malfunction on any important event. The nozzle is 0.3 mm for precise and fine application. It is made from durable stainless steel and can be easily cleaned. Dual action is perfect for controlling the amount of pigmentation applied and the overall final look. Features an option of internal mix with the high quality gravity feed which enables you to mix different products and shades for the most professional makeup look. Needle removal system for easy cleaning. Requires no maintenance due to the self centered nozzle design. Best angle for maximum control. It allows you to apply the desired amount of makeup without build up or cakiness. It is light to carry and won’t strain your hand. It can also be positioned in different angles to apply the most perfect makeup look. It features an underbody finger rest to allow for maximum comfort even after long hours of application which will allow the makeup artist to fully concentrate on the job done. It comes with an additional fine tip, additional fine needle and fine spray regulator for the most detailed and precise application ever. The extra fine application will enable you to use this kit for applying makeup to small areas like the eyes and the lips with zero flaws. It comes in an attractive case to be easily carried anywhere with style. It features a micrometer trigger stop setting. This allows users to spray pigmentation and makeup to 1/ 1000 of an inch with great and flawless detailing. It is easy to handle and maneuver and won’t strain your hand no matter how long you carry it. This is one of the easiest airbrush makeup guns to handle. You can easily open the magazine and feed the applicator using one hand. It is made from lightweight die-cast for durability without having to strain your hand after long hours of application. It won’t react with the chemicals in your makeup and is super easy to clean. Dual action to allow the user to control the amount of air and makeup released. It also features a trigger lock for safety to avoid over application that could ruin your makeup look. It is suitable to apply all makeup to the face and body, an even precise application on the eye or the lips with zero mistakes. It comes with 1 spanner and 1 plastic dropper for matching shades and products. This airbrush gun can be easily adjusted to suit different types of makeup applications. You can switch from low and light application to more dramatic and heavy application with just one click. It is super easy to clean to save time and effort. It can be used with different types of makeup allowing you to go wild with your application. It is easy to handle and control for the most precise and detailed makeup work. It is not heavy and will not strain your arms no matter how long you hold it. It is made from sturdy material that won’t react with your makeup. It is lightweight and can be easily carried around. Finding the best airbrush gun is a bit challenging. But understanding how the best airbrush gun should perform will make this decision so much easier. After reviewing these products, we reached a conclusion. We highly recommend the Badger Air-Brush Company RK-1 Krome Airbrush 2-in-1 Ultra Fine Airbrush. We love its sleek, elegant design and the fact that it is made from durable materials. The finger rest is a great addition and will be appreciated once you realize how fingers can get strained to achieve the best airbrush makeup look. We also love that it can be easily adjusted for the most detailed flawless application. We think that this product is of high quality and is a great buy that will prove worthy over time. We honestly believe that this could be the best airbrush gun out there.